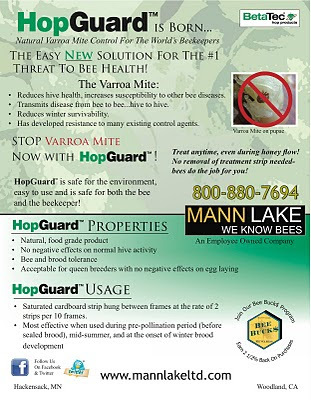 A beekeeper forwarded this link about colony collapse disorder. I will let the reader make up their own mind about the content. I asked John if he had any pictures of dead bees in front of a hive. He shared this one with me. This is what I would expect to see this time of year. Bees fly out for cleansing flights and don't make it back. As the snow melts there will be more dead bees in front. Something to consider. The hive goes into winter with around 50,000 bees. By March if there is four to five frames of adhering bees in a colony it may be around 20,000 bees. That is a attrition rate of 30,000 bees. They had to go somewhere. 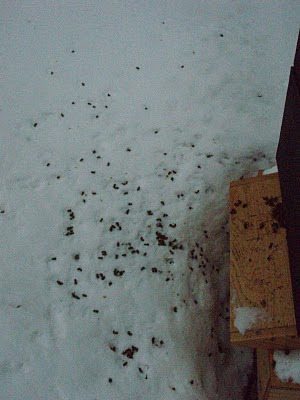 The bees that have met their demise are on the bottom board mixed in with hive debris or in the snow outside the hive. Thanks for sharing the picture John. I am expecting this last blast of cold weather not to have been too hard on the bees. This coming week the temperatures will be moderating back to the 20's and maybe a 30 in there. This should give the bee cluster a break to reorganize a bit in the hive. Hopefully they can move onto a fresh frame of honey. Bees will be going out on cleansing flights this week if it is sunny. Moving into this part of January if I lifted the top cover I would expect to see the bees would have moved up into the top box. This is the warmest part of the hive. The queen should be getting ready to start laying within the next two or three weeks. The spring build up of the bee population will begin at that time. If we have a cold blast like the one that came in this past week three weeks from now, there will be widespread colony loss. There will be brood in the hive by then and the bees will starve to death keeping it alive. As the queen starts laying, food consumption in the hive will go up. Bees can get caught by cold weather on a frame that has been depleted of honey. Starvation can occur if the cluster of bees can't move to a new frame of honey. I will be looking at my colonies in mid Feb to check the alive/dead status in case I need to order package bees to replace dead outs. 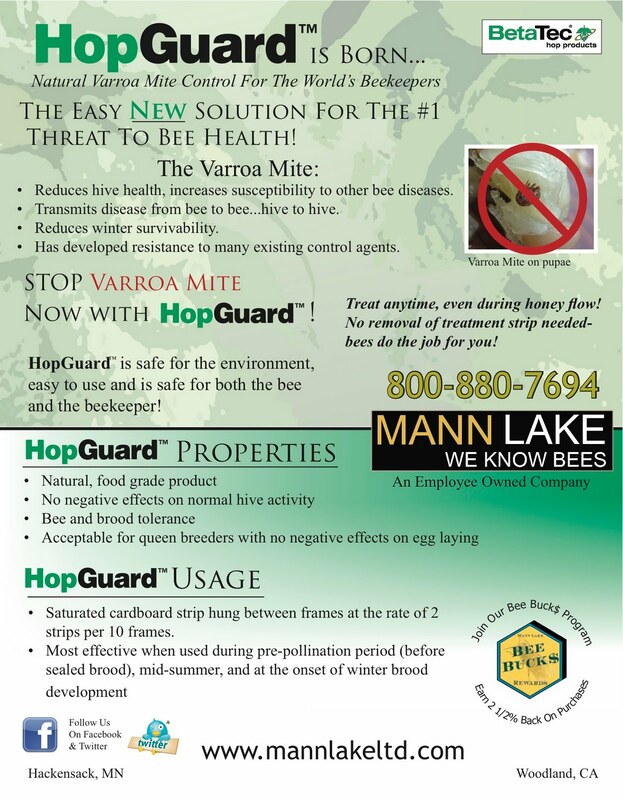 I have mailed out the bee order forms today. I suppose if you don't receive one by Monday, that I don't have your address. Then e-mail me and I will send you one. Update: This treatment will need a Section 18 approval from the USDA. Which hopefully may be done by early Feb. This food grade chemical compound comes from Hops. Hops is a plant that is used in the production of beer. The nice part about these strips is that the bees will chew up the cardboard strips and dispose of them in front of the colony. This is a new mite treatment on the market. While my post is a little fuzzy, the message of a mite treatment that can be safely applied during a nectar flow is awesome. Mites can build up and do serious damage to a colony starting in early August. Current treatments have to wait until late August to mid Sept. before they can be put in a hive, mites are causing damage to the bees and stressing the colony already almost a month before the current treatments are applied. Having a treatment that is a natural food grade product and can be applied in late July, during a nectar flow, may dramatically help wintering of our colonies. It will be interesting to see how effective this new compound will be. The cost of the strips is lower than many other treatments available today. Here is my 2011 package bee pricing, you will notice there is a $6.00 price increase from last year. This increase came from my supplier covering for his cost increases. I will be mailing out order forms within two weeks. If you feel that I don't have your contact information, send me an e-mail and I will send you an order form.